A successful email campaign can bring in a lot of business. Many Easton Communications clients have ongoing email campaigns to stay in touch with customers on their email list. 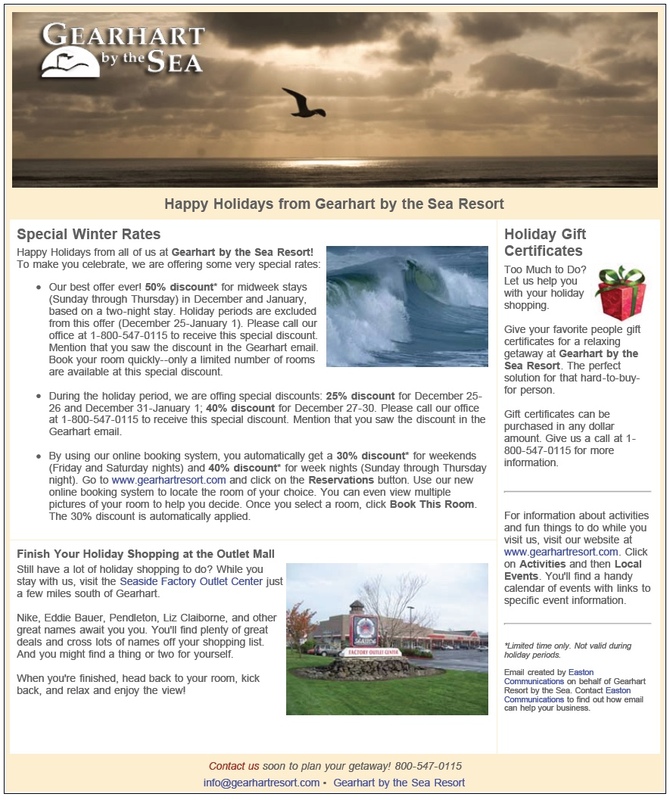 The picture below is a sample of a monthly email that goes out to customers of Gearhart Resort on the Oregon Coast, one of our clients. We use targeted email to announce special pricing for lodging at the hotel. To make the email enticing enough for people to read, we include other information of interest about activities going on nearby. Things such as dining, festivals, hiking, and other beach activities are typical stories. We try to include a balance of pictures and text to make the email aesthetically pleasing as well as interesting and informative to the reader. You can create email content using a third-party tool such as Constant Contact (my personal favorite), Cooler Email, or Mail Chimp. Each service has different features, but they all store a list of email contact information. A robust email list is often one of the most important virtual assets a company owns. An effective email campaign is designed to reach out to your customers in a timely and effective manner. Both the timing and the content of an email campaign can make a big difference in whether your customers actually read your email or whether they simply click Delete. When developing an email campaign, it is essential that the email only be sent to subscribers who have opted-in to receive the email. Each of the email service providers mentioned above manage email lists and help ensure your email isn’t treated as spam.